"Does anyone need a recipe for curd rice ?? ", I blurted out in bewilderment. "Yes, in fact a lot of them do. Else they will keep dishing out variations that range from being chewy to being downright watery", replied by frustrated husband. He had had a particularly bad day at office and it was exacerbated by the unpalatable lunch that the caterer had chosen to serve. Though the curd rice served by the canteen guys is never the best, it was really bad that day and had my husband fuming. Now even though I am not a South Indian, I have stayed down South for a long time and have picked up the nuances of quite a few South Indian recipes (especially the ones that my husband and kid adore). And I do make good curd rice ( a fact endorsed by my South Indian friends ). I find it easy, quick and quite soothing on the tummy. So, while it is a staple during the summers, I end up making it once in a while during the winters when I have had a heavy dinner on the previous night. Preparation - Take the still warm rice in a mixing bowl. Use the back of a heavy spoon to mash it up. Add warm milk little by little and mix it up. 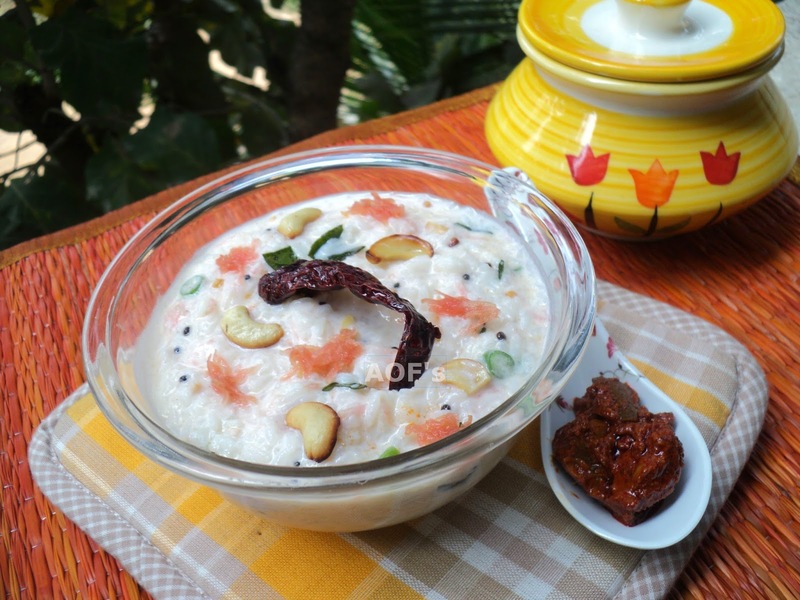 Allow the rice and milk mix to cool down completely before adding the beaten curd. Add salt, grated carrot and chopped green chilis to the mixing bowl and mix everything thoroughly. Heat the oil in a tempering pan. Add the mustard seeds, urad dal, cashews, dry red chili, asafoetida and curry leaves. Fry for 8-10 seconds. Pour the tempering over the contents of the mixing bowl. Mix it uniformly. Serve immediately along with a pickle and/or papad . Note - If you are making it for kids, do not put any green chilis. Instead add about 1/2 tsp sugar and fruits like grapes (chopped into small bits), pineapple (chopped into small bits) and pomegranate.